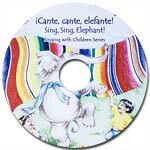 This is the audio CD that comes with Cante, Cante, Elefante! – Songbook & CD. This is for the AUDIO CD ONLY. The songbook is not included. It is intended as a replacement CD and comes in a plain paper sleeve.